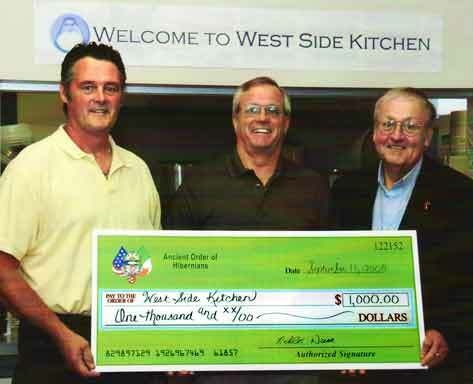 UTICA, Oct. 9, 2008 -- Utica’s John C. Devereux Division #1 of the Ancient Order of Hibernians recently presented a check for $1,000 to Mother Marianne’s West Side Kitchen. The donation was a portion of the money collected at the Great American Irish Festival’s Second Annual Irish Mass. The mass is sponsored by the Ancient Order of Hibernians. 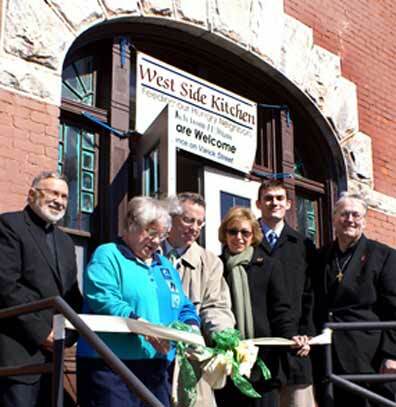 Opening its doors on March 10, 2008, the soup kitchen had served more than 10,000 meals by the end of September. Jim Sullivan and Nick Durr of the Hibernians and Deacon Gilbert R. Nadeau, soup kitchen director.